John 19:1 Then Pilate took Jesus and had him flogged. 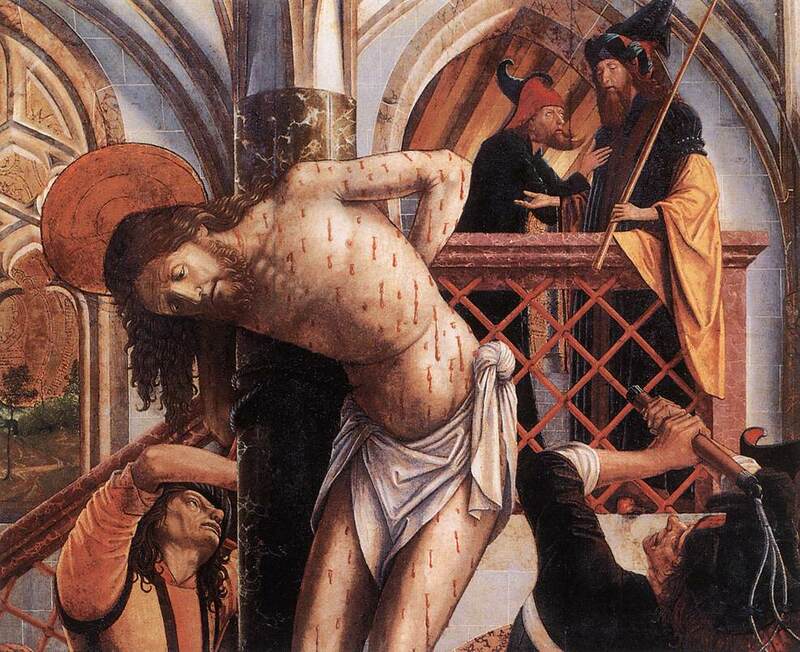 The panel was part of the altarpiece in the parish church of Salzburg, but only a few fragments remain. The work was Pacher’s last and, at 3300 Rhenish guilders, best-paying commission. Sadly, in 1709, the Franciscan friars of Salzburg condemned the existing altarpiece as “ancient and decrepit”, and it was dismantled. The severely trimmed depictions of the Betrothal and Flagellation that survived originally formed the front and rear views of one panel. Reconstruction evinces a double-transforming altarpiece with a shrine-height of 5.5 meters and an overall height of 16 meters, making it the largest known retable of this late-Gothic altar type featuring a Gesprenge (decorative super structure). Michael Pacher (c. 1435 — August 1498) was an Austrian Tyrolean painter and sculptor active during the last quarter of the 15th century. Pacher was one of the earliest artists to introduce the principles of Renaissance painting into Germany. He was a comprehensive artist with a broad range of skills: sculpting, painting, and architecture of complex wood and stone. He painted structures for altarpieces on a scale unparalleled in North European art. His influence is primarily North Italian, and his work shares characteristics with that of painters such as Andrea Mantegna; however, German influences are also evident in his work, especially in his wood sculpture. He was most active from 1462 until his death. Jesus Christ Yamagiwa Electric Corporation Ltd.